For many years I had shoulder-length straight brown hair, parted in the middle. It was a low maintenance “do”, requiring only an occasional trim. Although I liked short hair, it required more frequent and skilled cutting. Regular trips to the salon were not part of the particular culture in which I grew up in India. Short hair also meant a regular expense. At that time I had a lot of judgments about good/right things to spend money on and bad/wrong things. Haircuts fell in the bad category because I considered it materialistic to care about appearance. But the day came when I wanted to cut my long hair. With the help and encouragement of friends, and now living in the States where regular trips to the salon were a part of the culture, I was slowly reexamining my beliefs. I was emerging from a period in my life in which I didn’t want to be noticed, and my hair was the next step. Friends recommended a salon and I scheduled an appointment. The bald hairdresser listened as I described an asymmetrical cut and said, “You’ll have to get a new wardrobe, if I cut your hair like that.” Taken aback and hurt, I opted for something safe, a haircut I ended up not liking. I waited eagerly for it to grow out. Some time later I tried again at a different salon. I may have simply said I wanted something shorter, something different. This hairdresser understood my desire for change and he also heard my hesitancy. He suggested we take it slowly. So we did. Looking back, I see the struggle going on inside me. I wanted a haircut and didn’t believe it was okay to want it. I wish I could remember how I finally decided in favor of the haircut. I’m glad I did. I feel more myself with short hair. This feeling makes it worth the investment of time and money every six to eight weeks. Beneath this desire for a haircut was a desire to feel good about myself, to feel beautiful, to come into my own, to be more me. As I feel more myself, I am aware that I make more choices that reinforce these positive feelings. 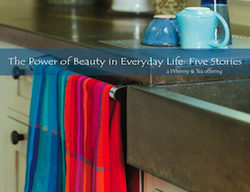 Choices that range from the right size and shape tea mug to the decision to create a business weaving kitchen towels. My judgments and struggles around purchases haven’t completely disappeared, but with each decision that supports who I am, the less investing in myself feels like a frivolous expense. It’s a necessity if I want to be true to myself. My invitation to you: What’s one step you can take for you to invest in yourself more fully than you have in the past? I’d love to hear. Just being willing and mindful about taking more breaks during my work day. Also investing the time and effort into simply feeling good about myself and my life. It’s easy to get into a negative funk and it doesn’t serve me. It does however require the willingness to stop long enough to notice what is going on. Judy & Sheryl, what great ways to invest in yourself — breaks & creativity. Investing time can be as challenging as investing money, can’t it? I agree about the short hair Marilyn–it suits you. After getting a perm and hair color for years I decided to go a la natural and discovered my hair had natural curl and wasn’t near as gray as I thought it would be–more like silver highlights. We women are ‘funny’ about our hair!